Every once in a while, a pregnant woman wants a refreshing simple meal that is nutritious and easy to assemble. 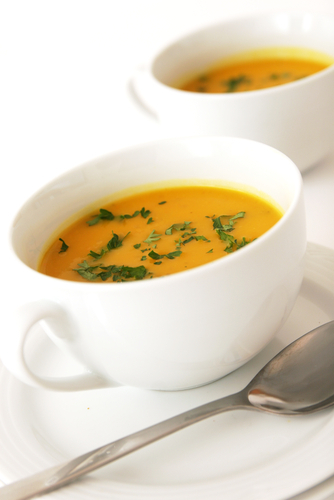 Coriander soup with lemon offers a boost of vitamin C and a gentle flavor that is perfect for those last few weeks of pregnancy when eating is hindered by baby’s size. This recipe can be easily changed up a bit by using lime juice or orange juice. Heat oil in a stock pot over medium heat. Add onions, green onions, ginger and garlic and sauté until onions are clear. Add vegetable stock, cabbage, carrot and coriander stems and bring to a boil. Throw in one-half the coriander leaves and cook for 5 to 10 minutes. Remove soup from heat and strain. Reserve the vegetables to serve on the side. Place strained soup back in the stock pot and add lemon juice. Bring to a boil and add remaining coriander leaves.